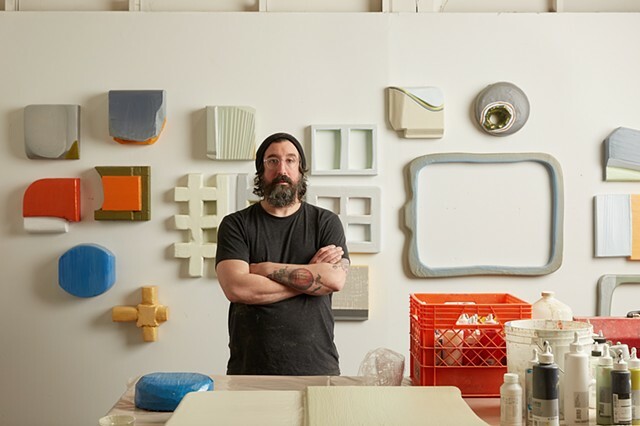 Kelly's work has been exhibited in museums and galleries across the United States and throughout Europe. His work has been the subject of multiple solo and group exhibitions, most notably in the survey of abstract painting "The Painted World" at PS1 MoMA. In 2019 Kelly was named as the inaugural artist in residence at the Penn Center for Neuroaesthetics. A full professor in Visual Arts at Mercer County Community College, Kelly holds a BFA from Maryland Institute College of Art and a MFA from Mason Gross School of the Arts. He is a member of the Tiger Strikes Asteroid network of artists, and his studio is in Philadelphia.